The higher-education classroom has undergone radical reformations in the last decade as a result of technological development, causing academicians across the globe to recognize the importance of technology in higher learning. 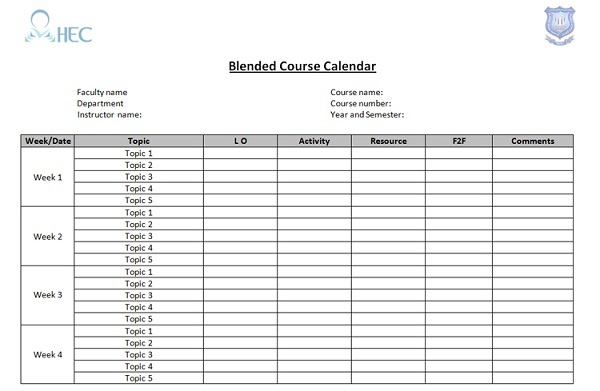 Blended courses combine face-to-face interaction with online learning and customarily involve the delivery of curricular materials, access to resources, submission of assignments, project based learning, activities that support higher order thinking, and online discussions that may be asynchronous or synchronous in nature. In order for a class to be considered blended some actual student learning and learning assessment must occur online and a percentage of in-class time is forfeited to make up for the weight put on the online learning activities. 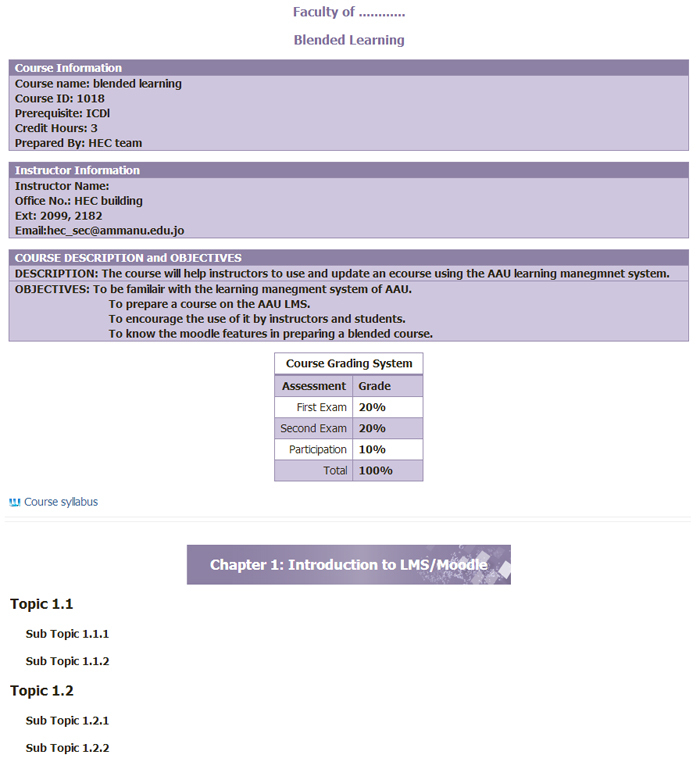 In this educational modality (blended learning), the majority of interactions between students and instructor occurs in the virtual environment of a Learning Management System(LMS) or course management system (CMS), which is capable of hosting and sharing all the learning resources and facilitating the learning activities. 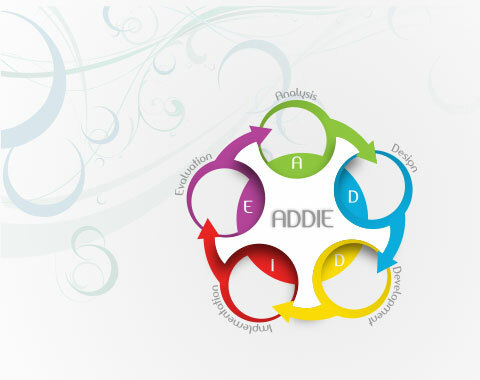 At AAU we are using Moodle system as the LMS. “Blended courses combine the best of face-to-face classes with online learning. With it, instructors can achieve their course objectives more successfully than they can in either a fully face-to-face or fully online course.” Young (2002). “In order for a blended course to be successful, a complete course redesign is necessary.” Garnam & Kaleta (2002). Initial section, Course syllabus: this information is the first thing the participant should see when entering the course, The instructor has a choice of presenting this information either as a single document attached to the course template or in several web pages ordered in a sequence. To develop a successful blended course, requires careful pedagogical redesign. Experience indicates that the students learn better when course is well planned and well organized. 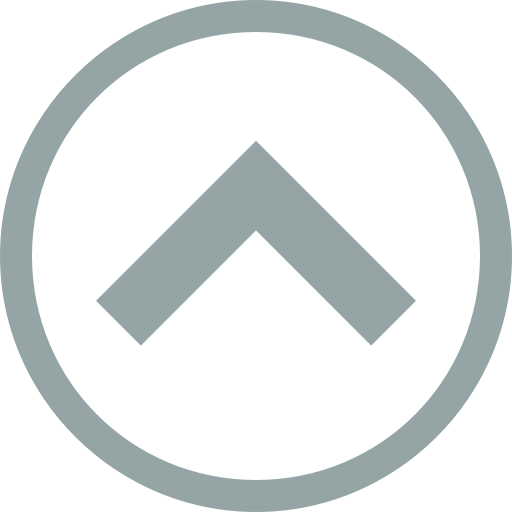 In essence, a course roadmap is very important, to develop a blended course. Create Content Outline (Course Roadmap): Begin thinking about how content in your current course syllabus Begin thinking about how content in your current course syllabus can be organized into learning modules. The best way to get started is to break down the course by its goals and objectives. What are your course objectives? This will guide the development and selection of learning activities and provide specifications for assessments. In this way, one can insure that the course redesign is focused on pedagogy and not on technology. Don’t worry at this point about what will go online and what won’t., list everything that you find useful. Young (2002). Which of those activities can best take place online? Blended teaching is not just a matter of transferring a portion of your traditional course to the Web. Instead it involves developing challenging and engaging online learning activities that complement your face-to-face activities. What types of learning activities do you think you will be using for the online portion of your course? Online asynchronous discussion is often an important part of blended courses. What new learning opportunities will arise as a result of using asynchronous discussion? What challenges do you anticipate in using online discussions? How would you address these? How will the face-to-face and time out of class components be integrated into a single course? How will you divide the percent of time between the face-to-face portion and the online portion of your course? How will you divide the course-grading scheme between face-to-face and online activities? Redesign is an incremental process. Try not to include too many new activities at first. Start small and you can build it one step at a time. Focus on the integration of the online and face-to-face components. Connecting what occurs in class with what is studied online is critical so instructors do not end up teaching two parallel but unconnected courses. Use the resources already available. Defining the interaction strategies of the student and writing content guides to facilitate this interaction. Selecting or producing multimedia resources for the purpose of learning. Selecting or creating assessment activities that will allow the students demonstrate their learning. Create course structure in Moodle: Start building learning modules or a course structure in Moodle based on your learning module outlines. Instructional materials development: Convert your teaching materials into an online format by rewriting your content into a brief and crispy way without missing the essence of the subject and better to provide it in the form of PowerPoint presentations or pdf for the student’s reference. Interactivity & Multimedia Development: You should provide supporting visual or multimedia elements such as Images, Animations, Videos, Audios etc for the better learning experience. (All of the above mentioned things can be produced through assistance from instructional designers and media production staff in the HEC). Create Moodle assignments, discussion forums, and assessments: You can use the activities and assessments available in the Moodle system to assess your student’s progress for each learning module or unit. Create Module Learning Guides: A learning guide is a document that serves as an itinerary or checklist for students as they progress through the module or unit. It lists the required assignments and activities which students should do for successfully completing the unit. Welcome Announcement: Create a welcome announcement for the students with a brief introduction about the course and how to get started in the course. Course Development Guidelines - Use the Course Development Guidelines and Rubric as a self-assessment tool to review your course. Peer Review -The HEC facilitates a peer review process where faculties have the opportunity to review the course in terms of course content quality, accuracy, the effectiveness of the course etc and to provide constructive feedback to improve the overall standards of the course. Evaluation - There will be periodic evaluation or surveys to collect the feedback about the course from the students and the faculty members and the valuable suggestions will be implemented in the blended course.